A car blocking the bike lane/cycle track. The source of much irritation and many social media photos. 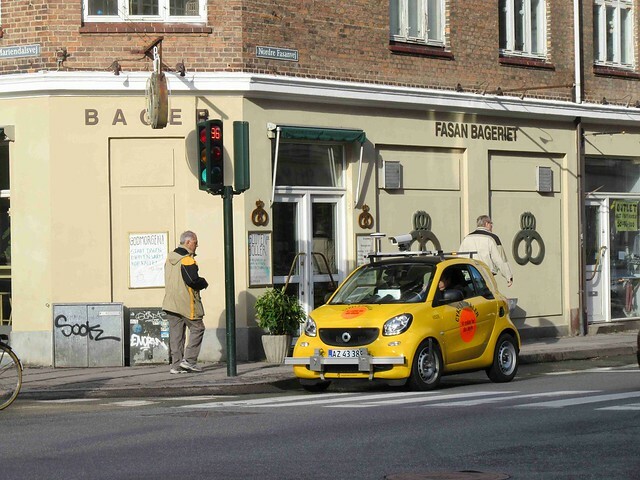 This photo, however, is from Denmark and that is a car that we WANT driving down the cycle track. Cities like Copenhagen and Aarhus don't just build the necessary infrastructure to encourage cycling, keep people safe and help make people FEEL safe, they regularly measure the quality of the infrastructure. Citizens always say in polls that the quality of the cycle tracks and bike lanes is of utmost importance to them when they are considering to commute by bicycle. 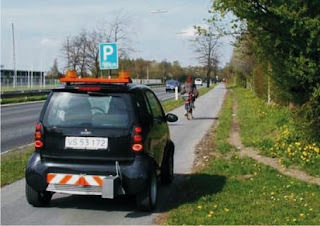 So, specially adapated cars like these are regularly sent down the cycle tracks to measure for bumps and smoothness, among other factors, using laser technology and recording the data. There is a veritable armada of vehicles designed to operate on cycle tracks. Street sweepers, municipal garbage collection and, not least, snow clearance vehicles like those in our classic article: The Ultimate Snow Clearance Blogpost.